Earlier this year, Jon and I helped out our friends who were expecting their first baby. We helped install crown moulding for the room and we reupholster their rocking ottoman with a pillowcase! Today, we are sharing how their room turned out. I wanted to share this back in August/September but I was afraid people would think we were expecting (even though we were we didn’t want to give any hints)! I’m in love with how modern and fresh it is. Our hope is to give other new parents expecting a sweet baby girl, some nursery inspiration with a coral and aqua pallet. So many details in this room to not be missed. The butterflies on the wall–our friend, Rachel, hand cut every single one of them. After she showed us that I told her I could have done that with my Cricut in no time! So it has me thinking about ideas for our sweet baby boys room! The cute little fabric elephant was two old shirts that she wrapped around to form the shape of an elephant! She also made a bird… so adorable, and practically free wall art! All she had to buy was the paper (which she bought for the butterflies and the frames from Ikea). The bed skirt was made with fabric she found online. Don’t tell anyone… it’s just pinned to the bottom of the crib! I plan to do something similar for our nursery. For months they searched for a dresser. We kept reminding them that it could be any color and they could paint it. We told them that painting a dresser is an easy job and anyone can DIY that themselves. So off they went to find a dresser and nightstand at a garage sale. They painted it white. They used the existing knobs and just painted them coral! I love the pop of color! The curtains are from Ikea! The aqua curtains are sheer and the white curtains are a thicker cotton material. Rachel and Ricardo (by the way, if you like craft beer, go check out Ricardo’s blog The Beer Guerrilla) bought the glider used (it was in great condition and didn’t need a fresh new coat of paint). They had a family friend recover the actual cushion part, and then I helped recover the ottoman while Jon was working on the crown moulding. This fabric was found at Target–it was a bed sheet set! Don’t be afraid to think out of the box. Rachel had a little bit of extra fabric so she made a little elephant pillow for the glider! 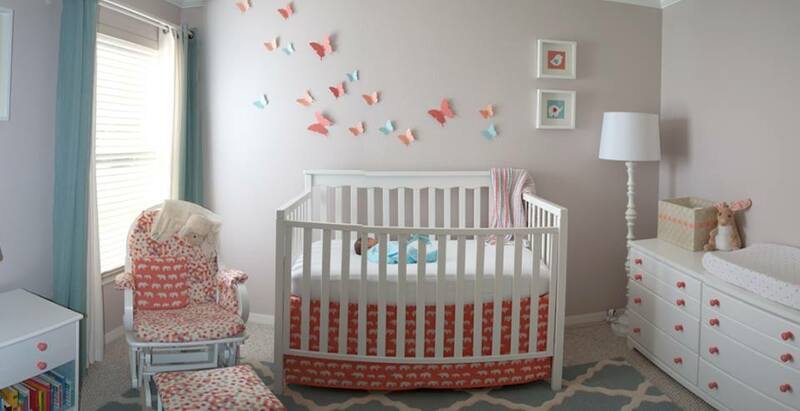 Their nursery looks like a million bucks but cost them very little due to all the DIY projects they took on! It goes to show that you can think out of the box, have a fresh and modern nursery that both you and baby will enjoy! Hopefully, I can share my baby boy design board in the next few weeks. Now that we are just about finished with the kitchen we know nursery is next on the priority list. 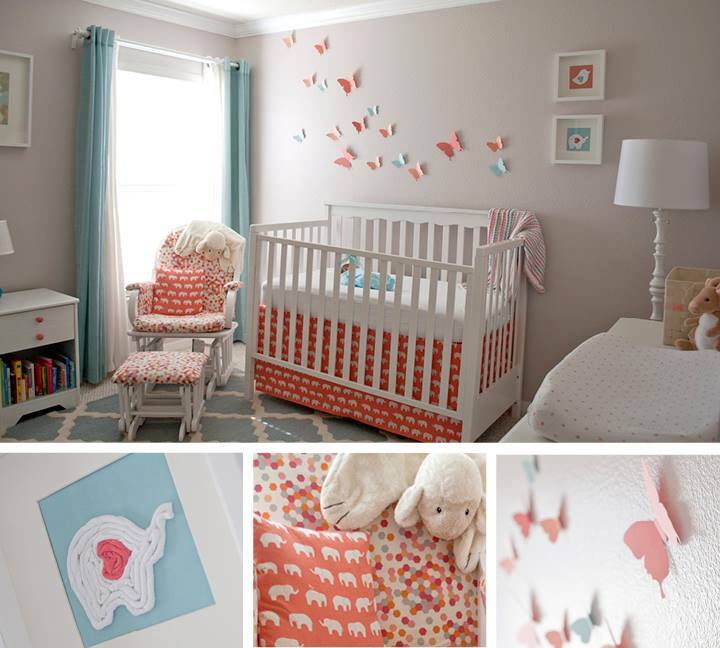 Kim–I’m in love with their nursery and plan to have them help me pick out colors/patterns for our nursery! This is exactly what I want to do for my little girl! 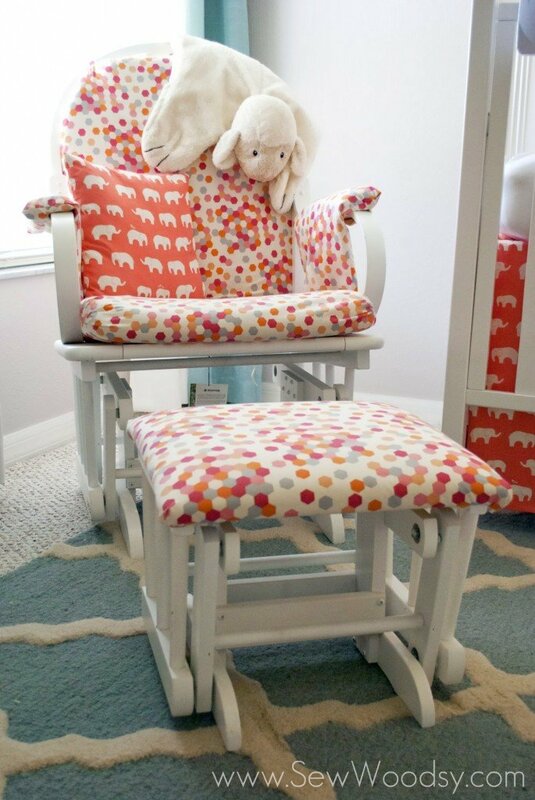 Can you share where you found the fabric for the rocker and the elephant fabric in the crib and pillow, also the carpet?? I’m SO in love with this room. FANTASTIC JOB!!!!!! Hi Kimi, I know that the coral fabric was found at Target–it’s a sheet set! The elephant fabric was found at JoAnn’s. Not sure where our friends found the rug! Good luck! Could you share the paint color of the walls? Please! Hi Lauren, Unfortunately, I do not know the paint color–this was our friends nursery. Sorry! Hi Sarah, thank you for reaching out. She actually hand-cut each butterfly. However, I just posted a tutorial on how I made a similar wall for my daughters nursery. You can find it herehere.